Difference between a Freeway, Interstate and a Highway? Before exploring the key differences between the different transportation ways, it is probably best to begin with the definition of each. The exact definition of the freeway is that it a restricted-access highway that does not include any tolls. All vehicles are allowed to run for free, which means that they do not charge any fees for passage. So it is aptly named as a “free” way. The freeway is the general term that denotes the divided highway with complete control of access, which means that there are no pedestrians, bikes, horses, signals or intersections. Cars also tend to yield from on-ramps and there are generally no tolls. A highway can be defined as a public-access thoroughfare, which means that it may or may not be a restricted access travel way and it may include tolls. Tolls simple charge all vehicles with a tax to have one-time passage or multiple runs. The highway is the general term that indicates a public way for the functions of vehicular travel. Both freeways and highways are the main roads that join cities or different areas. Though both freeways and highways are public motorways, which connect important towns or cities, there are some differences between them, even though, many people use the terms interchangeably. The major differences between freeways and highways are that freeways generally handle more traffic than highways. People, who would like to travel long distances, usually prefer the freeway to travel instead of the highway. This is a result of a freeway allowing the vehicle to travel at significantly higher speeds. Though there are speed regulations while traveling on the freeways and the highways, the freeways generally allow for faster travel speed. One more difference is that freeways tend to pass through lower populated areas, whereas highways may go through more crowded places. Due to this reason, freeways are inclined to be the better choice for people who take a long distance trip. Usually, freeways do not come with many road junctions, whereas highways may come with several junctions. There may be toll booths at special points on a highway whereas a freeway does not include any toll booths. When considering lanes, freeways have more lanes than highways, usually more than four lanes. On the other hand, highways contain only two or four lanes. 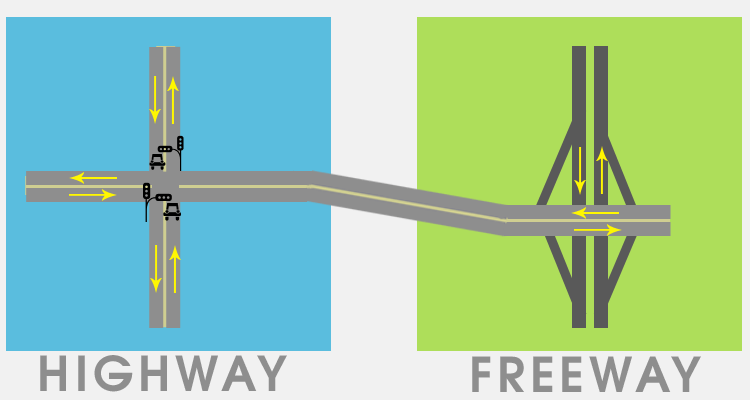 Freeways normally have dividers or barriers between two directions, whereas highways do not usually have dividers or barriers between the directions. Furthermore, freeways have ramps for coming in and going out of the road and they do not have traffic lights, traffic islands, cross traffic and stop signals, whereas highways do have all of these. Usually, freeways are operated by the central government, whereas highways are owned by the state. Most of the road repairs on the highways are totally undertaken by the state government, whereas in the case of the freeways the road repairs are also undertaken by the states, but on a proportionate basis to be shared with the central government. Generally, interstate roads are restricted access, which means that they do not include stop lights, but they may have an on or off ramp. On the other hand highways generally allow for normal side road entry and they have regular stop lights. A highway is a complete access highway, similar to a main road and it includes houses, businesses, and direct junctions. The maximum permitted speed for a vehicle to run on a highway is 55 mph. On the other hand, an interstate highway is a restricted access highway that is destined for commute and it includes no property entries, and interchanges at high velocity, ranging from 65 mph to 75 mph. The interstate system was originally created in 1921. This was the inception of the use of the word interstate. A freeway is a restricted access highway, with or without ramps and it has no cross traffic, in general. Freeways are mostly found in big cities and highly inhabited areas and they are included as a part of the interstate organization because the interstate goes through a big city. Alternatively, an interstate highway is a part of the central highway system and it mostly goes across several states hence the name “Inter” “state”. A freeway is a kind of road intended for safer high-speed operation of automobiles through the exclusion of at-grade junctions and they are usually separated by a minimum of two lanes and a maximum of four lanes. However, an interstate highway system is a structure of highways that serves almost all major cities in a country. Though there are some major differences between a freeway and a highway, both are used for the same purposes – to get from here to there. Though both freeways and highways differ in vehicle driving speeds, preference of people, taxes and in other factors, most drivers will use both of them multiple times a day and not even know it.